Tablets, smartphones, and laptops have changed the way people work. No longer are workers chained to a single desktop computer. And no longer do they store all their important documents, PowerPoint presentations, videos, and reports on one machine. This has led to a rise in the BYOD movement, with flocks of employees toting their mobile computing devices to work in their backpacks each day. As the Everon business blog says, this trend – which stands for Bring Your Own Device – isn’t slowing any time soon. The trend is also, more importantly, changing the way businesses across the country operate. Businesses in the past often frowned upon letting employees use their own laptops, smartphones, or tablets at work. The fear? That employees would take important company data out the door with them should they move on to new employment. Other companies worried that employees would infect their computer systems with viruses by connecting their mobile devices to company servers. These fears, of course, are still very real ones. However, innovative companies are also realizing that there are several benefits to those businesses who embrace the BYOD movement. The BYOD movement might even give businesses who allow employees to bring their personal devices to work a significant productivity boost. According to a recent story by PayScale.com, 16 percent of companies surveyed by SAP and NetBase said that a BYOD policy might help boost sales at their companies. The reason? Employees who can use their personal devices at work might also complete more company work after hours. By relying on devices that they are familiar with, they might be able to turn in even more impressive marketing materials and reports. Both of these factors could result in a boost in sales and a boost in company profits. PayScale cites the experience of security firm ADT, which reported that its sales doubled in some areas when the company let its employees use iPads. Such a move also helps companies cut costs, the PayScale story said, and helps ensure that the move to mobile solutions occurs more efficiently. Of course, not everyone is a fan of BYOD. The PayScale story found that one in eight companies worry about liability issues should something go wrong with employees using their own devices. A total of 15 percent of respondents said they worried about confidential company information falling into the wrong hands should employees lose mobile devices. Trade publication IT Manager Daily recently ran a story on its website providing valuable advice for companies moving toward a BYOD policy. One of the keys, according to the story, is that companies should create a clear, written BYOD policy that outlines the responsibilities of employees. For example, the policy could state that employees who share company knowledge stored on their personal devices with outside parties could face disciplinary actions, including losing their jobs. The written policy should also spell out the responsibility of the company itself. And employees should sign an agreement acknowledging that they have read and understand the company’s BYOD policy, according to the IT Manager Daily story. The Everon blog adds a few other factors that employers need to consider when creating a BYOD policy. First, employers have to determine who pays for mobile voice and data charges. Next, they need to establish minimum system requirements for the mobile devices that their employees want to use. There are financial factors to consider, too. Employers, for instance, might decide to provide a financial stipend to help employees obtain their mobile devices. And who pays for repairs should a device malfunction? Companies must also determine whether all data stored on employees’ mobile devices must also live on the company’s file server. These are important questions, and some of them are challenging. But a written BYOD policy that answers these questions will spare businesses from future problems. Such written policies will also make certain that employees have no excuse for violating companies’ BYOD policies. 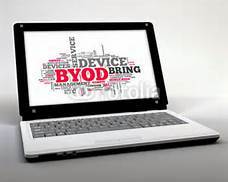 What are the most important advantages associated with a BYOD policy? The IT Solutions Blog lists many advantages that students receive when they’re allowed to bring their own devices to the classroom. Surprisingly, many of these advantages pertain to workers, too. For instance, IT Solutions Blog says that because students are already familiar and comfortable with their own devices, they can focus on actually learning instead of deciphering how to use the device. That holds true for employees, too; they won’t waste time trying to determine how a particular device works. At the same time, consumers’ personal devices tend to be more up-to-date than much company technology. A BYOD policy can help companies more easily, and inexpensively, keep up with the latest technology. Another benefit, according to the IT Solutions Blog? Students might be more inspired to continue learning after school if they are allowed to use their own devices at school. That’s a benefit that employers should seek, too. Their workers are more likely to work after hours if they can take home company data on their personal devices. The Everon blog adds a few more benefits of a BYOD policy. The biggest? Employees are more accountable for their own productivity. Workers can’t blame malfunctioning company equipment or an inability to access company computers for turning in work or assignments late. Companies also can save time and costs by not having to create a hardware lifecycle plan or keep inventories of electronic assets. When employees rely on their own devices, such inventories are no longer a necessary job. Change is always a challenge for companies. And many might still resist putting a BYOD policy in place. Such companies, though, run the risk of being left behind as the computing world turns increasingly to mobile devices. Yes, a BYOD policy brings risks, real risks. But it also brings real benefits. And a growing number of companies are realizing that these benefits outweigh the risks.